According to the etymology the name Haghpat (Hakhpat, Haghbat) comes from the word "haghb"-meaning strong and pat- meaning wall. 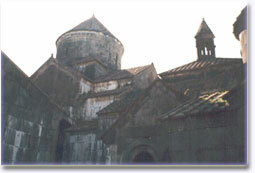 The village of Haghpat, six kilometers from the city of Alaverdi, is the location of the biggest monastic complex of medieval Armenia. 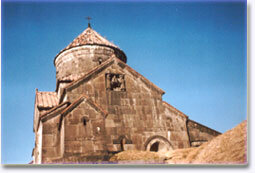 The monastery is known as one of the most famous centers of Armenian medieval cultural and religious life. 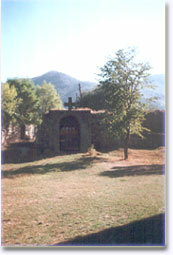 Haghpat was founded in 976 A.D. during the reign of King Ashot III Bagratouni. The oldest structure of the monastery is the church of Sourb Nshan (Holy Sign) which is a domed-hall type and was consecrated in 991 A.D.. Two side chapels were added later, the largest one built in the beginning of the 13th century and the smaller, known as "Hamazasp House" built in 1257A.D.. 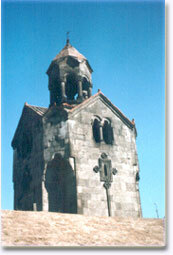 In 1245 A.D., a three-story belfry was built which stands alone. The church remains today without substantial alterations. The monastic complex also includes a small domed church of Sourb Grigor (1005 A.D.), the chapel of Sourb Astvatsatsin (13th century), the scriptorium (13th century) and the big refectory (13th century) which is outside of the monastery limits.The monastery has been devastated many times, and suffered from the 1988s erthquake, which is mentioned by the historians Samvel Anetsi, Mkhitar Ayrivanetsi and the others.Enemy devastations made the monastery congregation think about ways of protection (forts, hiding-places, etc). A number of splendid khachkars (cross-stones) of the 11th-13th centuries are standing on the territory of the monastery, the best known among them is the "Amenaprkich" (All-Savior) khachkar standing since 1273 A.D..
Haghpat is known as the principal center of manuscripts and writing art. Many manuscripts have been preserved in the scriptorium of the monastery, including some very well known documents from Armenian scripture. 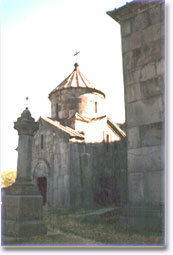 Haghpat Monastery has always been the center of the attention of the citizens and the government of the Republic of Armenia. Taking into consideration the age of this monastery, which is about 1000 years old, it is still in good condition and will amaze many future generations.